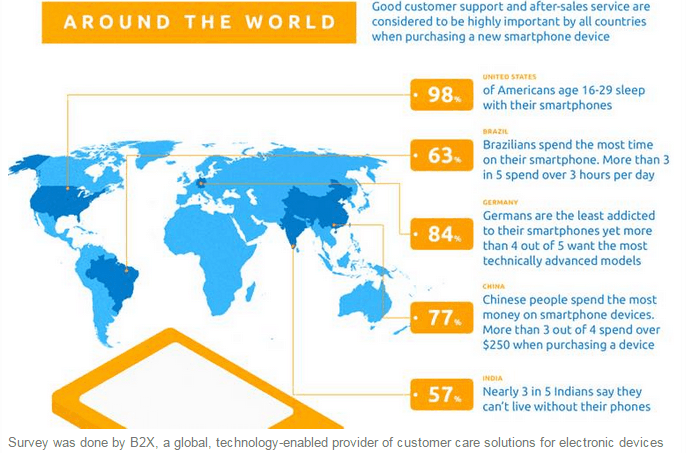 A recent global survey conducted by B2X Care Solutions, which is a provider of customer care for smartphones, 57% Indians can’t live without their smarphones. In fact, people in India are found to be so addicted to their smartphones that 98% of them sleep with their smartphones and 83% keep it on their body or within reach throughout the day. The survey that was based on mobile device usage, consumer behavior and service expectations polled over 2,500 smartphone and tablet users from the top five smartphone regions globally that are the United States, Germany, Brazil, India and China. The survey also discovered that when it came to handing over their smartphone, Americans, Chinese and Indians would be less likely than Germans to do so, even if they were given $100 a day or $500 a week to go without it; they however might have done it in case of tablets, in comparison. The surveyed smartphone users in all the countries preferred to give up their TV before their phone. Interestingly, smartphone users in the US were alright with forgoing a bet friend while in Brazil had no problem saying bye to their spouse or partner to retain their phone. Indians and Chinese however would have traded it off for a car at least. Talking about the repair or exchange service for a device, one third or respondents in India and half that in China had used it usually covered under the manufacturer’s warranty. Repairs in India, China and the USA were mainly covered by an extended warranty in comparison to that in other countries. 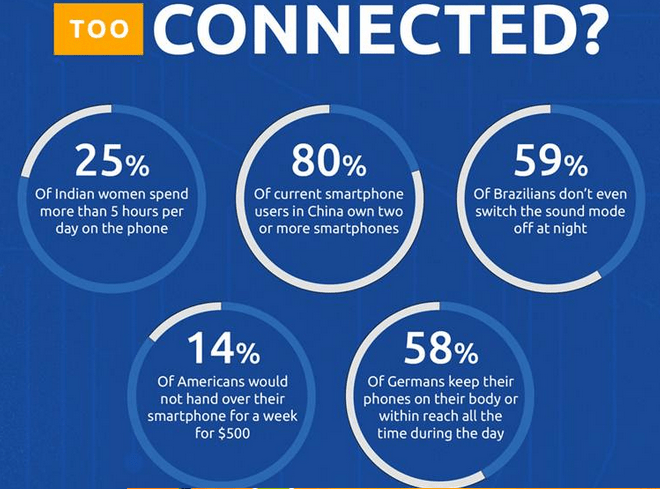 With 63% users spending more than 3 hours per day on the phone, Brazilians are the global leaders when it comes to Smartphone usage while India with 42% is number two, well ahead of USA at 26%.